A free copy of the book is now available to download as a PDF. 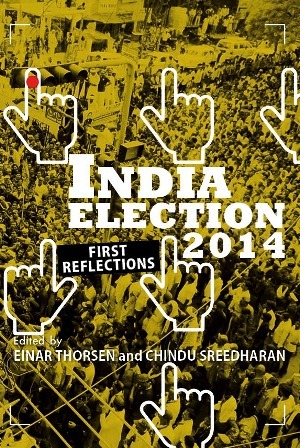 The 2014 Indian General Election was the world’s largest exercise in representative democracy. With 834.08 million registered voters (more than 18 times the size of the electorate in the 2015 UK election), some 1,700 national and regional parties, and 8,251 candidates – it was a “marathon event”, staggered across 36 days, in nine phases, from 7th of April to 12th of May. The election produced unprecedented news coverage in the Indian media, a flourishing landscape of some 410 news and current affairs TV channels, 250 private FM radio stations, and more than 12,500 newspapers and 81,500 periodicals. The growth of online news and social media in India added a new dimension to the media environment. However, as observed by our Media School’s academics, although news organisations had increased their activity on social media, mining diligently the political discourse there like never before, the resultant coverage appeared not to focus adequately on marginalised voices. Thus in March 2014 the Project India website was launched to produce an alternate news coverage of the Indian election and to focus on issues that the mainstream news media failed to report on. This book is a continuation of that intervention, with particular emphasis on marginalised voices and the plethora of poll discussions that played out on social media. With contributions from scholars and journalists from India, UK, US, and Australia, it brings together media practitioners and academics to scrutinise the mediation of the “world’s largest election” by both legacy and social media. Einar Thorsen is Principal Lecturer in Journalism and Communication at Bournemouth University. Chindu Sreedharan is Senior Lecturer in Journalism and Communication at Bournemouth University. 3. Modi and the TV media: propaganda or profits? 18. The return of the hegemonic national party?